The Pittsburgh Penguins' quest for a three-peat is officially on. 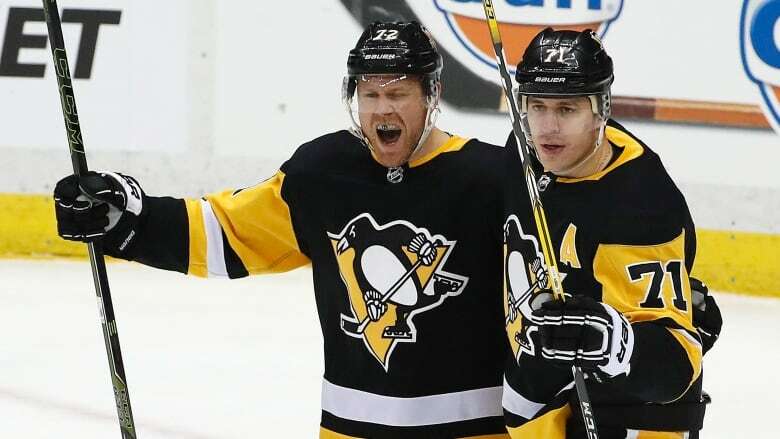 Patric Hornqvist picked up his 200th career goal and the two-time defending Stanley Cup champions clinched their 12th straight playoff berth with a 5-2 victory over the Montreal Canadiens on Saturday night. "The first part of the year was a bit of a struggle," Sullivan said. "It wasn't anything we didn't anticipate as a coaching staff going into it." Sullivan didn't panic — to be fair, he never really does — and instead offered a reminder to his team that nothing was inevitable. The proof came on Saturday night, when a pair of third-period goals by the NHL's best power play pushed Pittsburgh to a 5-2 victory over Montreal to clinch a franchise-record 12th straight post-season berth. "If you don't make it to the playoffs you can't win the Stanley Cup," said forward Patric Hornqvist, who picked up the 200th goal of his career in the first period. "That's the first step in this room, to make the playoffs. Now we have to make sure we try to get better every single time we come to the rink. We know what it's all about in the playoffs. Hopefully we'll have a really fun run." Something that's become a rite of spring since Sullivan took over in December 2015. The Penguins became the first club in nearly 20 years to win back-to-back Cups last June and considering their play since New Year's Day, they look like a very legitimate threat to give the NHL its first three-peat since the New York Islanders won four straight from 1980-83. Pittsburgh is now 26-10-3 in 2018, a surge that's pulled the Penguins within three points of first-place Washington in the Metropolitan Division. The Capitals visit PPG Paints Arena on Sunday night. "By no means are we satisfied," Sullivan said. "We know there's another level to our team and that's what we're striving for." "We will use these last couple games to try to find some little things so we are ready to go for when the playoffs start," Murray said. Jeff Petry and Jonathan Drouin scored for the Canadiens, who lost for the fifth time in seven games. Antti Niemi made 28 stops but Montreal couldn't handle the NHL's top-ranked power play. The Penguins went 3 for 5 with the man advantage, including Kessel and Sheahan scoring less than two minutes apart in the third period to blow open a one-goal game. "At the end of the day, our penalty kill gives up three goals and if we're not going to do the job right, we're not going to pay the price," Canadiens coach Claude Julien said. Niemi actually began the season as the Penguins' top backup after Marc-Andre Fleury was traded to Las Vegas and Murray became fully entrenched at the top spot. The plan lasted all of a month. Niemi found himself on waivers in late October after going 0-3 with a 7.50 goals against average, all of the losses coming on the road. While Niemi has rediscovered his game in Montreal, perhaps it's fitting the Penguins reached the post-season with their former teammate — however briefly it lasted — in the opposing net. Niemi's awful numbers in Pittsburgh weren't entirely his fault. The play in front of him at times was lethargic. "Obviously you want to go into the playoffs with a lot of swagger and a lot of confidence," Hagelin said. "Hopefully we can string a few more together."